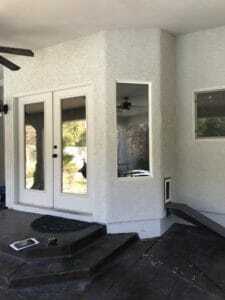 This project called for moving an existing wall an door opening further out into patio by removing the angled walls and bringing out the new walls flush with existing door. The double door will be replaced with a sliding 5 panel door system while also extending and bringing patio out. 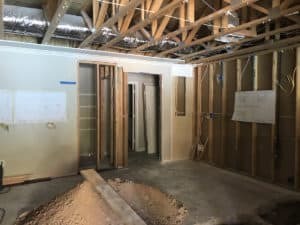 This was a total transformation; exposing walls, ceiling, removing tile flooring, relocation plumbing and gas lines to new locations. We also added a kitchen hood with a new venting system. 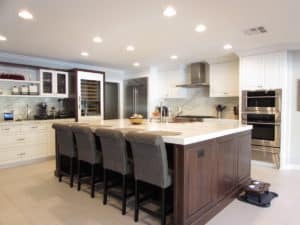 The new kitchen looks great with the additional lighting as well as the colors chosen for stone counters, backsplash and cabinetry. As usual, our subs and crew did an amazing job transforming this kitchen. 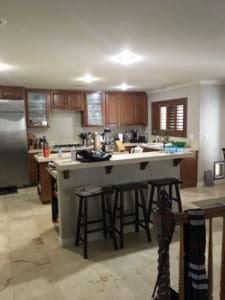 The picture on left shows the kitchen before with a small island and a breakfast counter. The sink was located just under the window overlooking out to pool. This sink was removed and a new larger sink was placed on the new island. The new Island added more space for gathering as well as sitting. The old kitchen wall housed the ovens on one wall, with an entry on each side of wall to other areas of home. 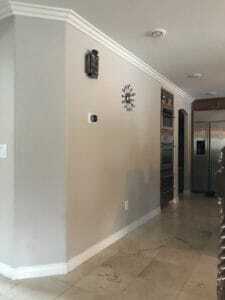 The new wall is now part of a cabinetry system. Where the ovens used to be, the whole was closed up and on that spot there is now a stand up wine cooler. On this series of pictures, we show the kitchen and entry leading into a bedroom and pantry. Next picture shows the framing removed along with exposed concrete and trench for new plumbing lines. Last picture shows the new kitchen from the same angle. New vent was added, Ovens changed locations and Island houses the new sink. 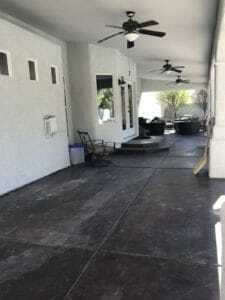 The Last two pictures show the old patio and the new patio. 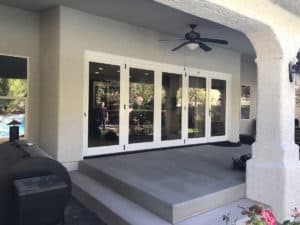 Double door was replaced with new folding door system, while patio was extended out. 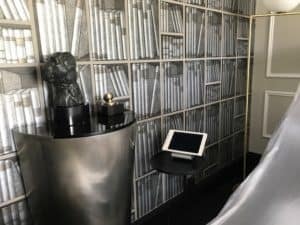 This Library remodel was part of a complete home remodel that included landscaping, new walls in a bedroom, shower tub improvements at master bedroom, etc. 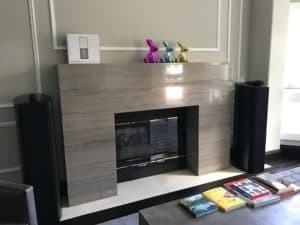 The fireplace in room was replaced with a stone surround. room was repainted, new lighting added and the “library” wall was finished with wall paper. The design on this wall is very detailed fooling the eye at first view. 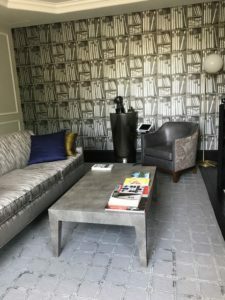 The designer completed the look with a rug over the wood floor to match entire room. 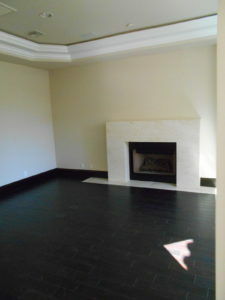 New Fireplace with new treatment on walls. Color scheme was changed. The new wall with wall paper resembling library shelves. 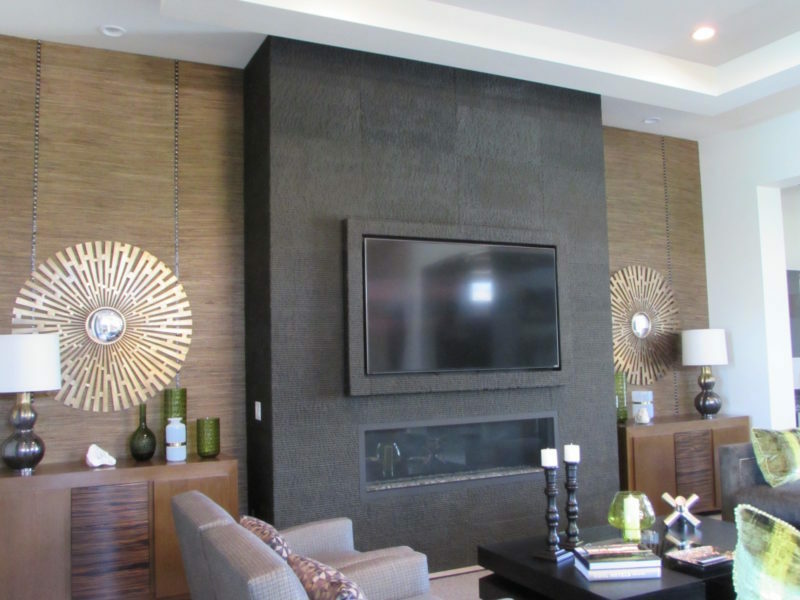 The combined creativity from designer and owner produced great results throughout this home. 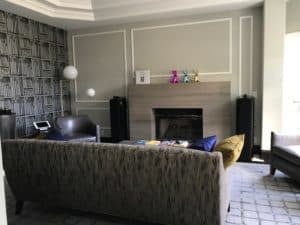 This is only one of the rooms we worked on. 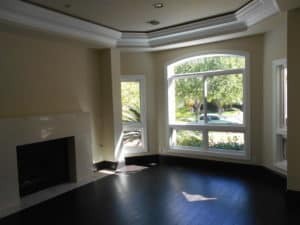 The workmanship of our crew comes through in all areas of the house. 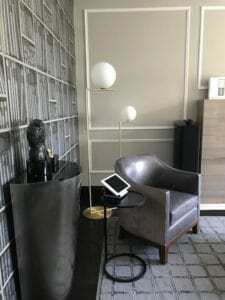 The pictures below show some of the details throughout the “Library”. 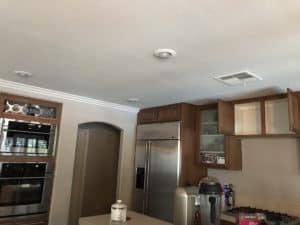 In this kitchen area, the owner wanted a complete new look. It was important for him to have a “Wow” factor for when he entertained his guests. Our In house designer presented a few options for the new look. 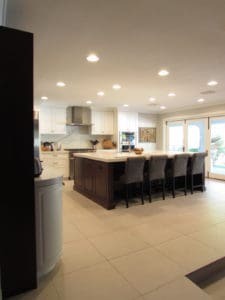 One of the features he wanted changed was to remove the light/soffit in ceiling and also move the sink from its location (Closer to the windows on right) and wanted it centered in radius. The finished kitchen can be appreciated in the picture above. 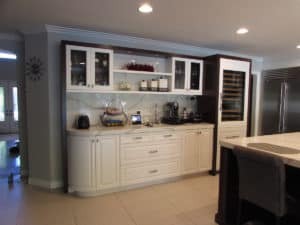 Cabinets in a Sapelle finish with a rich dark color and dark veins running horizontally across panels. The counter top was a Caesar stone in a light color. This same stone was used for all counter tops including the Butler’s pantry. 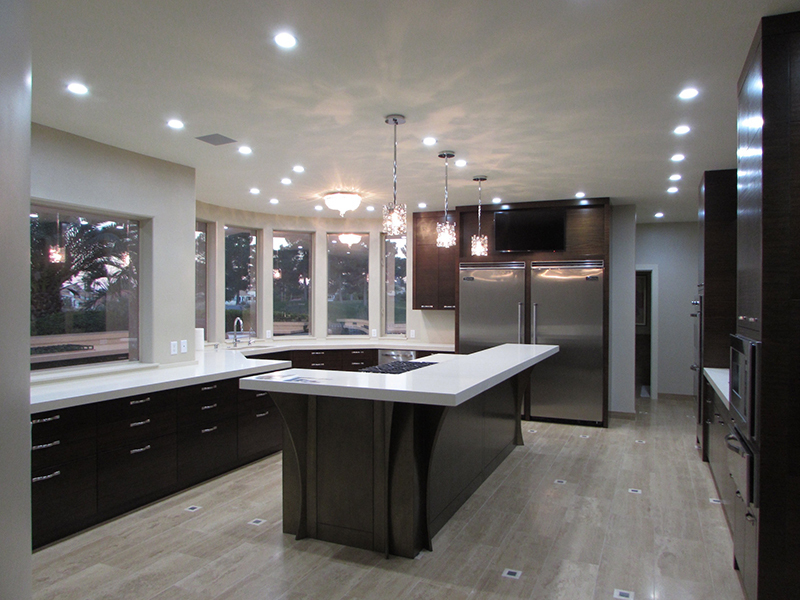 LED lights were added along with pendants over the island and a chandelier over radius area in kitchen. The island was of a different finish to match an existing table with a greenish bronze base. The walls were painted with a –metallic- pearl finish, which glistens and changes shades with lighting in kitchen.